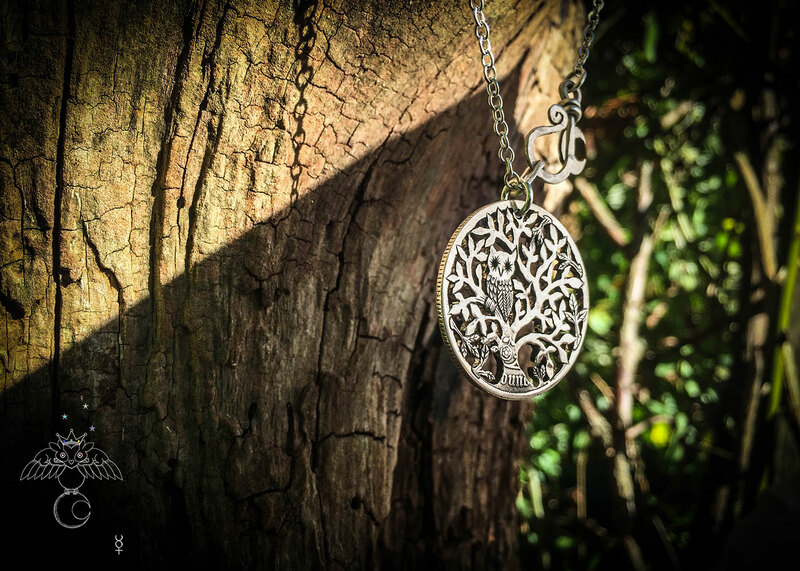 The tree and owl have been carefully planned and drawn with the purpose of recycling 1800’s gothic Florin coins. 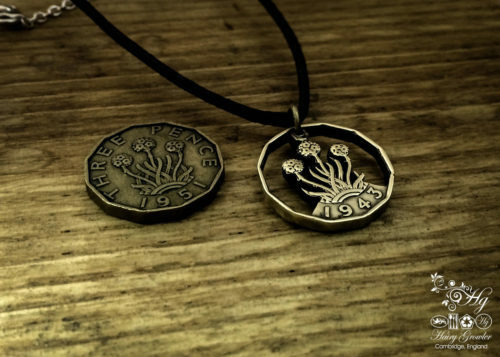 These particular coins are the perfect thickness and diameter to take advantage of in creating an ethical, original piece of wearable folk art. 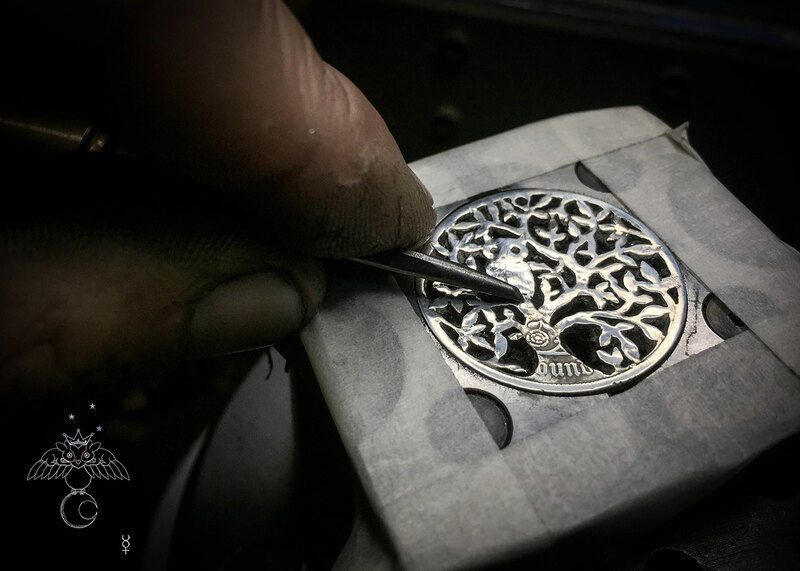 The unique Tree of Life with owl design is handcrafted using traditional hand tools and techniques. 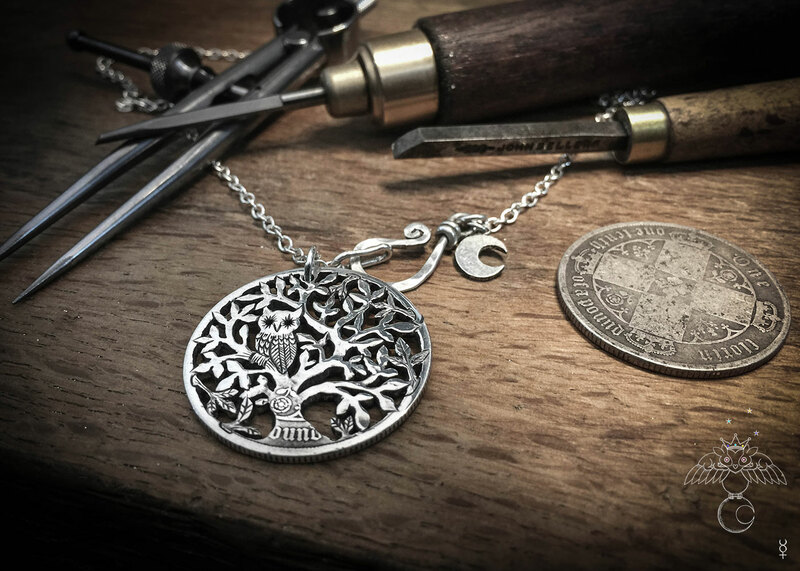 Hairy Growler workshop is an independent artisan jewellery studio which creates ethical jewellery made from recycled silver coins and spoons. 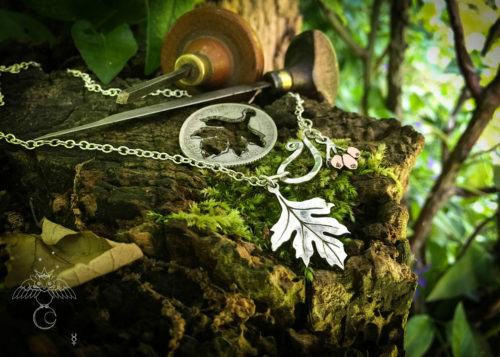 Each design is inspired by the earth realm in which we have found ourselves. 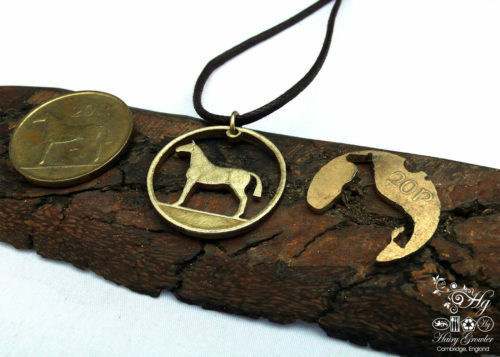 To begin the process of transforming an old silver coin I initially find the perfect ‘donor’ coin. 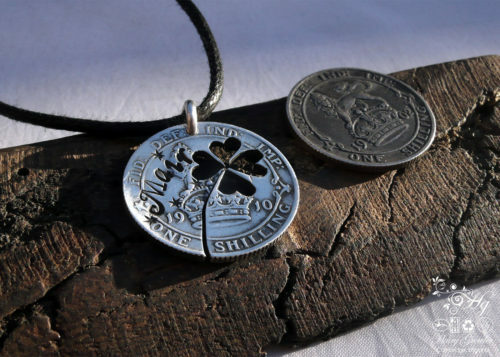 This involves selecting a suitably worn and unwanted (by collectors) coin destined to be melted down for silver value. 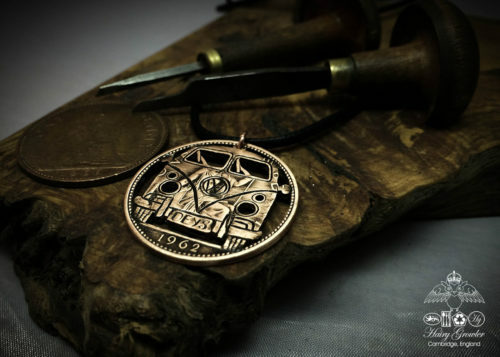 I like to preserve features of the original coin to keep its history and unknown story alive. This in itself is a process that takes time and consideration. 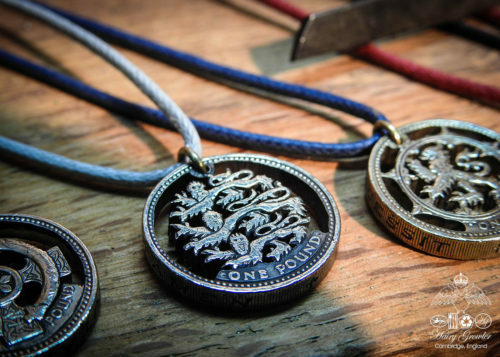 Too much coin detail over powers the design as a piece of wearable, desirable jewellery. 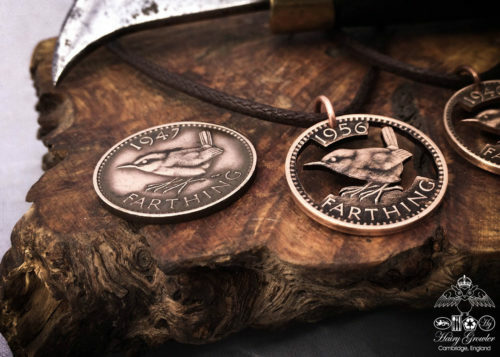 Similarly too little original coin detail the finished piece is at risk of looking like a regular piece of ‘ethically thoughtless’ jewellery. Not my style. Given that I am about to undertake work that I will give a lot of time and attention too in a life with limited time and attention! I like to use my experience and discernment. 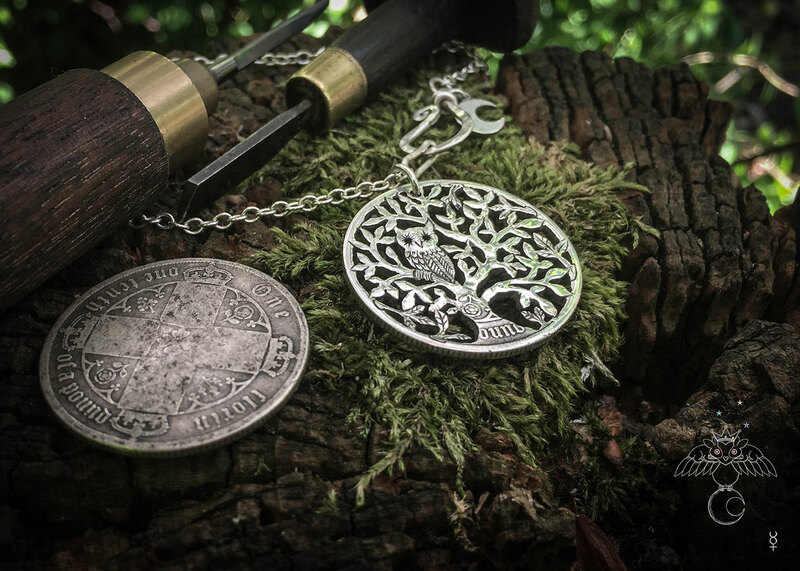 So, we’ve got the coin in question, now I proceed with rough sketching the design of the tree and owl on to the coin surface, and yes I use a magnifier sometimes. Once this is roughly as I see it should be I use a fine point needle to scratch the over the ink so I have a guide which is more durable, the ink generally wears away with continuous handling. 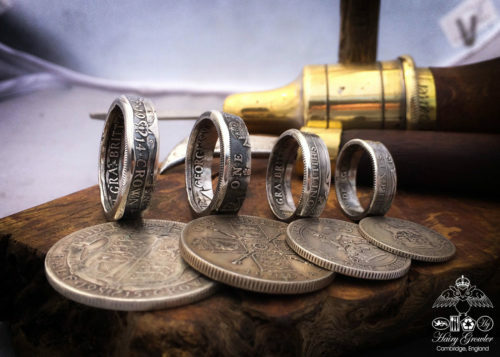 Once this prep work is complete I start work drilling 0.5 mm holes through the coin. 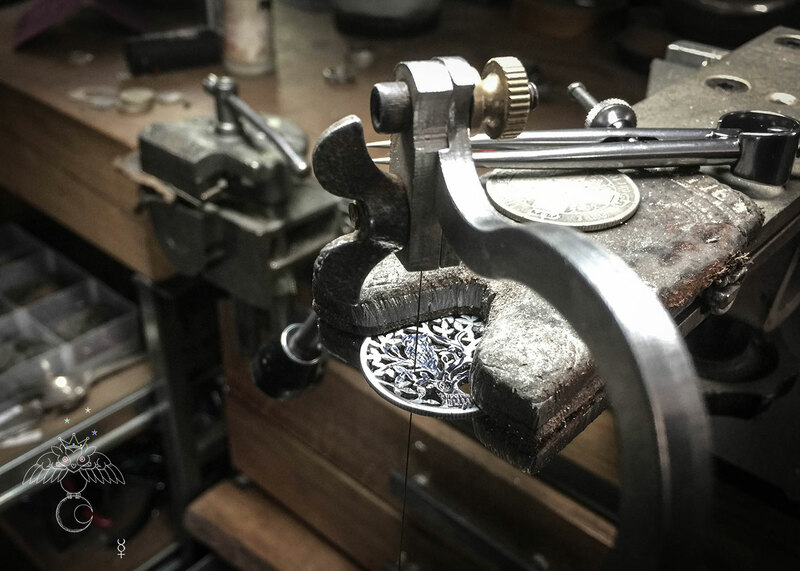 These holes are positioned between leaves and branches to each section can be hand cut our with my favourite jewellers saw. 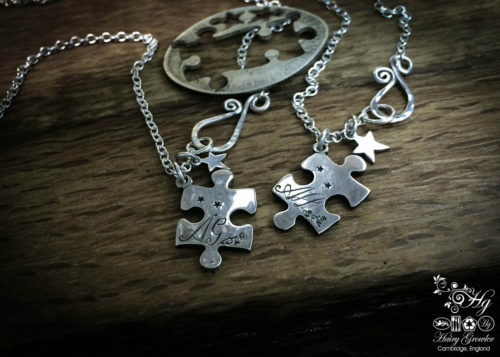 Consequently this lengthy process creates a piece of jewellery which is completely ‘one-off’, unique and original. It is a process I cherish and find mentally freeing. Upon completion of this phase I highly polish the remaining tree of life and owl outline. 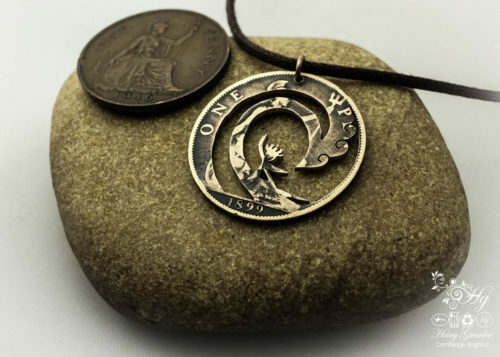 Now the coin is looking like a necklace pendant and is ready to be hand carved and engraved, also using traditional hand tools and techniques. 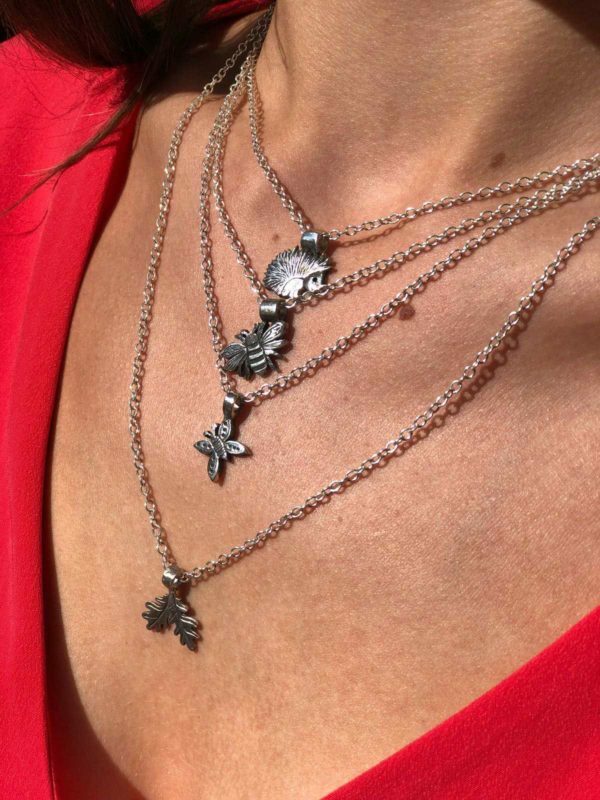 It is these delicate precision cuts which bring the deisgn to life. From the owl feathers to the veins on the leaves each cut is made with purpose and intent to create a work of which I will be proud. 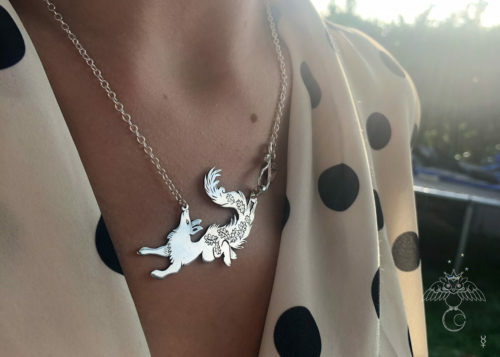 The finished work is offered with or without a silver necklace chain complete with the trademark Hairy Growler hook clasp and charm. 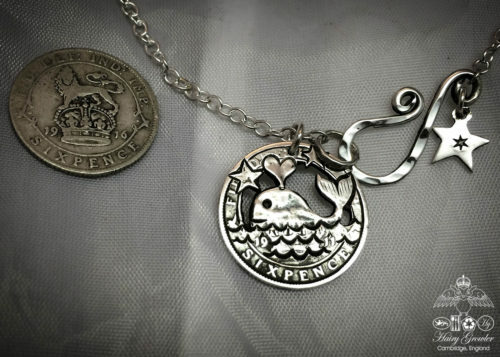 The piece is approx 30 mm in diameter.